The birds are singing, the flowers are blooming, and a certain Sunday is just ahead. So, what are you getting that amazing mom for Mother's Day? You don't have to spend a lot, but you do need to remember her in a special way. If you have brothers and sisters, or at least a very loud voice yourself, you can serenade your mom as you bring her breakfast in bed. Look here for songs for little ones. Older kids might want to check out Rise Up Singing, a group song book with the words to lots of old favorites. Not a singer? Time to get crafty and make her something to treasure, or you can give her coupons for treats mothers love. Sometimes the best way to celebrate Mother's Day is to spend some time just with her, sharing a book that the two of you will enjoy. Still searching for a great gift idea? The Web sites listed below have crafts and "instant" presents to put a smile on mom's face. 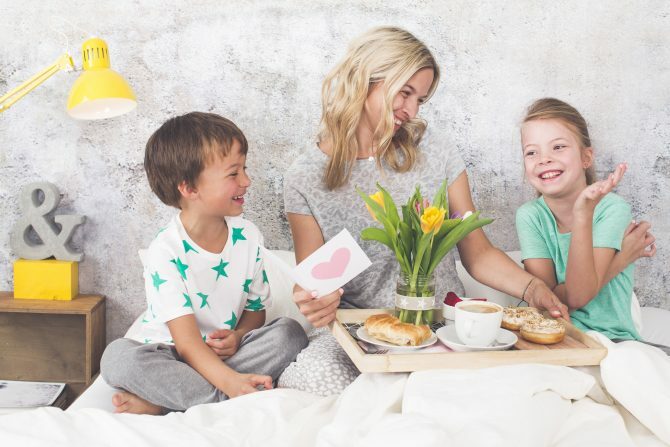 Recipes, crafts, cards, and poems to help make the day special for a special mom. If you're a cooking kind of kid, you'll find lots of yummy, sweet treats to make for mom. Are you a crafty sort? What mom wouldn't love a brooch or paper flowers that will last forever? Get together with the rest of the family, and check out ideas for throwing your mom a special party. Make mom some personalized stationery right from the Web. Includes more coupon ideas (dusting the furniture, wash the dishes, even reading mom a book!) and beautiful flowered wall paper for her computer that wishes her a happy Mother's Day.